I do not follow football and am ambivalent about Irsay. However, his donation - likely more then any other individual has given in Indiana - must be taken in the context of how much he donates annually. As far as you know, he may have already pledged millions to other charities. Neither you nor I have any idea how much he gives annually so don't be so quick to judge. I am sure that the people who are helped by the donation are appreciative. Veracity I think the point of Paul's post is to taking into context how much taxpayer money he receives annually -tens of millions of dollars. This bragging is sickening. He probably pays more than 25,000 in property maintenance fees each month. 25,000 is at best 0.25% of what we were forced to give him to placate him. You can't have selective vision with these matters. What Irsay has done may be legal, but it is absolutely immoral and unethical. 1) Why would Irsay publicize this small donation, if it's not a PR ploy ? 2) For $25k, Irsay got free, positive media coverage. So basically the donation is an advertising expense. I'm reminded of the Gates foundation offfer of $100,000 for whoever could develop a condom that men would enjoy using. What's wrong with this picture ? 1) Condom manufacturers spend bazillions every year trying to achieve this goal. The $100k is chump change. 2) For $100k, Gates got free, positive media coverage. So basically the prize is an advertising expense. unigov, I really don't see the connection to bill and melinda gates and irsay...at all. the gates haven't made a fortune by forcing hard working tax payers to pony up tens of millions of dollars. that is the story here - a cabal of corrupt,self dealing and self deluding professionals who take and take and take, and then spin and spin, and then put out a press release when they give away a fraction of a percent of their ill gains to a worthy cause. 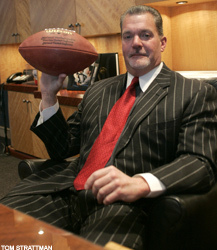 i'd like to see irsay and his friends give back the money they legally stole from the people of indiana.